For this tutorial we will focus on the Snow Debris Hut. 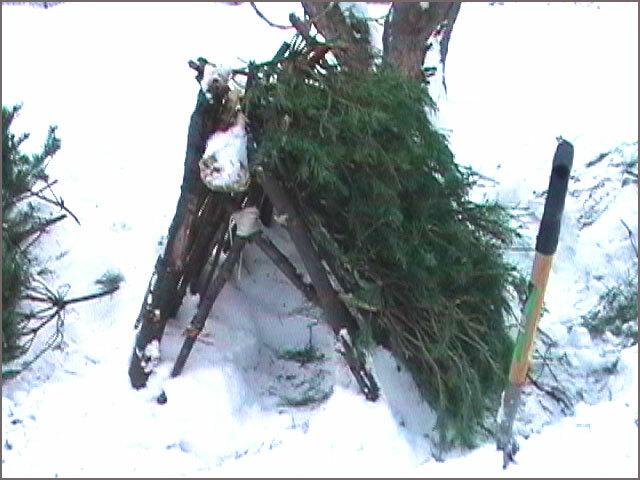 If we find ourselves exposed in the bush in the need of shelter the Snow Debris-Hut here is an option that can be built relatively quickly provided that there are enough natural resources, energy, and time. It is always good to practice survival skills BEFORE you need them. This gives you an opportunity to work out any logistic and/or tactical issues. As well as ingrain procedures and habits that will save you time and energy. 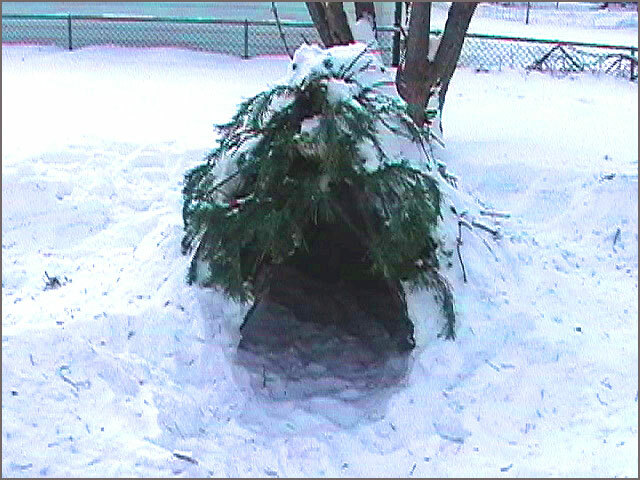 Many people have died in cold weather conditions when just a little knowledge on how to build a simple winter survival shelter would have saved them. Unexpected things can happen - lost hunters, downed aircraft, hikers caught out at night when they underestimated the time it takes to get from point a to point b. Perhaps someone has been injured and you are faced with going for help, leaving them alone in subfreezing weather with little chance of survival in the open. For this tutorial I took advantage of the fact that my smoke-bush tree was in sore need of pruneing. So the first ice-storm of the season unfortunately did it for me (poor tree). 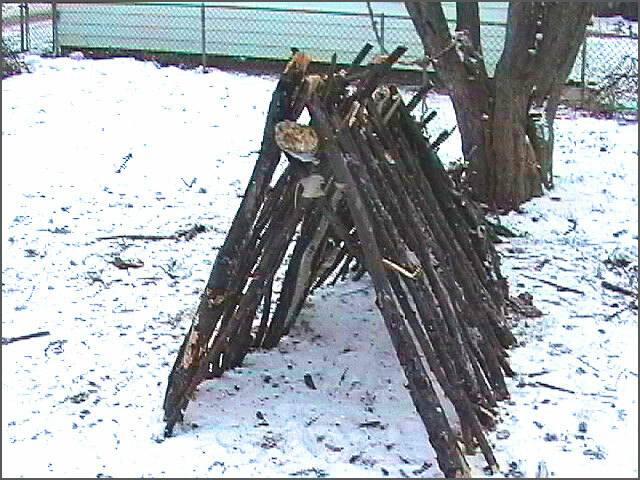 So the clean up of all its branches provided me an opportunity to practice a Winter Shelter. This was also an opportunity to work on a project with my daughter. Kids love to play in the snow, and this afforded an opportunity to have some "together-time" and start teaching her some Earth-Skills. We also got a chance to recycle a couple of discarded Christmas trees after The Holidays. The hut, for the most part is incomplete; it would need much more evergreen boughs both for the interior and the exterior. Also, I would want to build a doorway to minimize the exposure to the wind, drafts and the sky. Lastly, at least 3 feet of snow should be covering the entire structure for maximum effectiveness. However, as both practice, and for the sake of explanation the hut, as is, would work in a pinch. After all the whole idea is to provide a buffer between you and the elements. Primarily, the purpose of a shelter is protection from the elements. In the case of a Winter shelter be sure it is away from wind and precipitation. Area for shelter should be relative dry and well-drained. Keep away from valleys, washes, troughs, and depressions. At least 50yrds from water your source. Safely away from fires or areas with dry grasses, flammable fir boughs, peat bogs and the like. Your fire source should be safely away so that sparks and coals are least hazardous. Avoid plant and animal hazards. Like not in the middle of a poison ivy patch or on a nest of ground-dwelling yellowjackets. Comfort, be sure you are not laying down on a large rock or lumpy tree root. Comfort and mental well-being is an enormous asset in a survival situation. ATTENTION: NO FIRE SHOULD BE BUILT INSIDE OF shelter of debris of this type and design! 1). 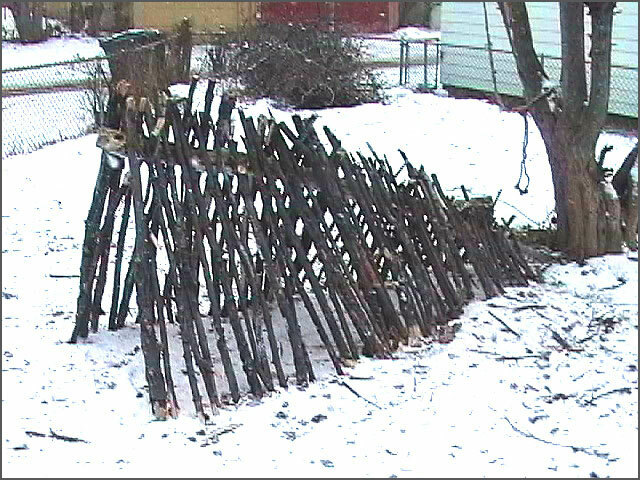 Please refer to the non-Winter Debris-Hut tutorial for basic structure. 2). Creating an A-Frame structure. Here the poor smoke-bush tree suffered some limb-breakage from an ice-storm at the start of the Winter season. So I decided to use the broken branches for various projects including this tutorial. Here we took the branches off the discarded evergreens and began shingling the frame with the branches from the bottom up. 4). 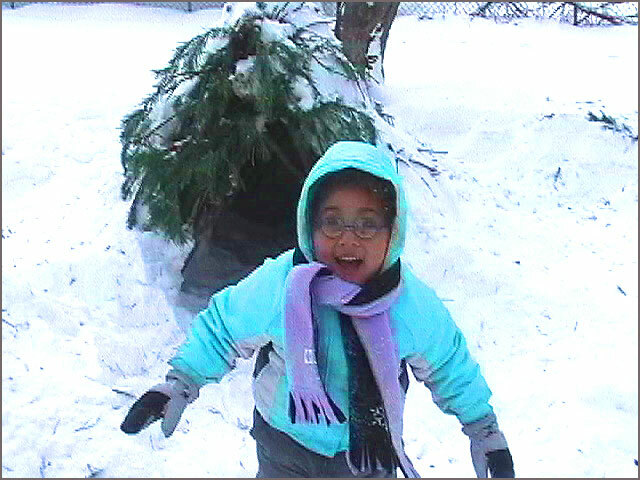 Once the evergreen branches are in place we added snow to the sides and top. It would have been nice to have 2 more trees. The more evergreen boughs the better to create dead-space and trap air for better insulation. And the branches and needles would make fine bedding for the inside. It is important to keep your body of the cold ground in order to conserve heat. Thick blankets or sleeping bags would work too. But the general idea is to create protection from the elements.